As a teenager, I had no money of my own (the waiting on job I had paid £20 a night, money which normally went on my mobile and on Sainsburys chocolate chip cookies) and so I couldn’t afford to wear the clothes I liked in Topshop, instead having to persuade my mum each time I liked something. This method was not usually that sucessful. I got used to wearing the same things as other people (when there’s so little choice, you don’t really have many options) and would go back to Chester to buy things occasionally. Now I have moved to Bristol, I feel like I have more options of what I can wear without being laughed at by people I know, so over the past few months, I have been storing certain items away. So thats my story of clothes buying. Now I have the abilty, I want to wear things that don’t look like my mum bought them * So it annoys me slightly that Topshop seem to produce things now that wouldn’t look good on me, no matter how it was styled. This top could probably be quite nice, if it wasn’t for the enormous ruffle that goes all around the body. Any girl with a cup size more than a B probably will look like she should be a clown or something. OH MAN. Who has decided that this sort of playsuit is acceptable. This is only going to look good on very tall, very skinny people. I saved the best till last. We are not in the early 90’s, and I don’t care if its supposed to be fashionable. It wasn’t cool the first time round. Maybe thats why it’s only Ãƒâ€šÃ‚Â£25. 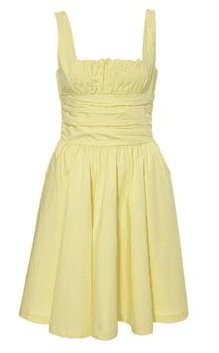 Sometimes Topshop does have some lovely stuff, such as this yellow dress from the Kate Moss collection. It currently hangs in my wardrobe waiting for July so I can wear it for my dads wedding. I do feel a bit wrong when I admit that its from the Kate Moss collection, bearing in mind her “designs” have produced these shorts which are so hideous, I can’t even put a picture here. Sometimes though, it feels like they stock over the top items to see if people will actually buy them. What do you think? Am I just being too old fashioned, is Topshop just very “fashion forward”, or do they stock items they think people will just buy because its from Topshop? * To be fair to my mum, she was often wearing new things from places like New Look. My mum was well cool. It seems that it has become fashionable for designers to produce items over the last year or so that can help the enviroment, or that has some sort of slogan on it regarding ethics. This in turn has trickled down into the usual channels and we now see places like Topshop, New Look and Primark selling similar items. Whilst there is the obvious upside of this (erm…the planet doesn’t die? ), it can sometimes feel like people will be buying these products as a way of saying they do something, but the reality may be different. 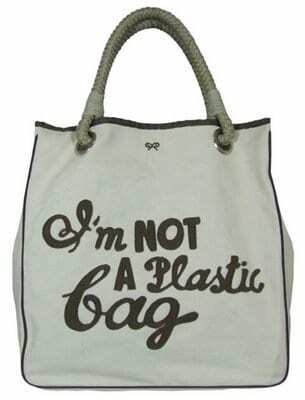 A good example of this is the Anya Hindmarsh “I’m Not A Plastic Bag” sale last April. Normally, a similar sized canvas bag will currently cost you over Ãƒâ€šÃ‚Â£250, so the excitement of being able to purchase this bag for Ãƒâ€šÃ‚Â£5 was great. People were queuing outside Sainsburys (the sole retailer in this country) for hours waiting for their chance to purchase a cut price designer bag. In the weeks before the bag went on sale, various celebrities were seen carrying this bag, which added to the hype. 20,000 bags were made, and sold out within an hour. I had considered waiting myself for the chance to buy one of these bags (as Sainsburys is just a 5 minute walk from my old house) but I had work to get to and couldn’t be late. The bag was designed for people to put their shopping in, and to (rather obviously) not use a carrier bag. Instead, there were reports of people asking for carrier bags to put this bag into so it didn’t get dirty. Even when sourcing shop fittings for their only store in London (why not one in Bristol? ), they have tried to keep things local to their factory – Pembrokeshire oak in the fittings, curtains from a wool mill in Carmarthenshire and the shop designers were from Tenby. I guess my point is that being able to say that a product doesn’t harm the environment in its manufacturing is a Good Thing, but I dislike that point being used by the consumer to say they are “better” than you for buying this item. Its better to buy the clothes and not promote this fact to everyone.